34 MMS January 2017 mmsonline.com RAPID TRAVERSE Machining Technology in Brief But now we can't inspect them fast enough.' I've seen this from companies with single robots all the way up to large customers with 30-foot rails with machines on both sides. Sometimes, it doesn't even enter their minds that a process can be automated." 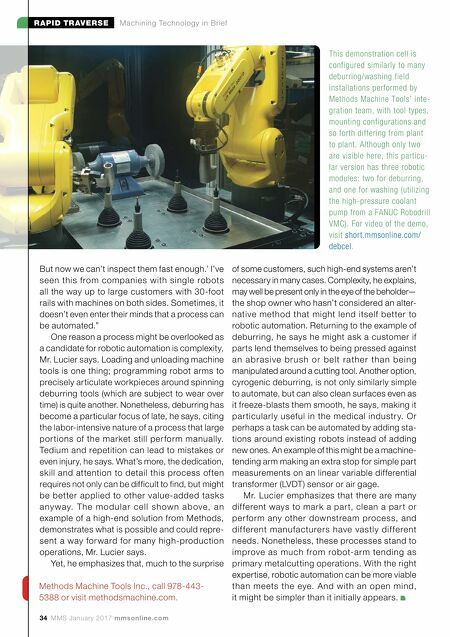 One reason a process might be overlooked as a candidate for robotic automation is complexity, Mr. Lucier says. Loading and unloading machine tools is one thing; programming robot arms to precisely articulate workpieces around spinning deburring tools (which are subject to wear over time) is quite another. Nonetheless, deburring has become a particular focus of late, he says, citing the labor-intensive nature of a process that large por tions of the market still per form manually. Tedium and repetition can lead to mistakes or even injury, he says. What's more, the dedication, skill and attention to detail this process of ten requires not only can be difficult to find, but might be better applied to other value-added tasks a ny way. T h e m o d u l a r c e ll s h ow n a b ove, a n example of a high-end solution from Methods, demonstrates what is possible and could repre- sent a way for ward for many high-production operations, Mr. Lucier says. Yet, he emphasizes that, much to the surprise of some customers, such high-end systems aren't necessary in many cases. Complexity, he explains, may well be present only in the eye of the beholder— the shop owner who hasn't considered an alter- native method that might lend itself better to robotic automation. Returning to the example of deburring, he says he might ask a customer if parts lend themselves to being pressed against a n a b ra s i ve b r u s h o r b e l t rath e r th a n b e in g manipulated around a cutting tool. Another option, cyrogenic deburring, is not only similarly simple to automate, but can also clean surfaces even as it freeze-blasts them smooth, he says, making it par ticularly useful in the medical industr y. Or perhaps a task can be automated by adding sta- tions around existing robots instead of adding new ones. An example of this might be a machine- tending arm making an extra stop for simple part measurements on an linear variable differential transformer (LVDT) sensor or air gage. Mr. Lucier emphasizes that there are many dif ferent ways to mark a par t, clean a par t or per form any other downstream process, and dif ferent manufacturers have vastly dif ferent needs. Nonetheless, these processes stand to improve as much from robot-arm tending as primary metalcutting operations. With the right expertise, robotic automation can be more viable than meets the eye. And with an open mind, it might be simpler than it initially appears. This demonstration cell is configured similarly to many deburring/washing field installations performed by Methods Machine Tools' inte- gration team, with tool types, mounting configurations and so forth differing from plant to plant. Although only two are visible here, this particu- lar version has three robotic modules: two for deburring, and one for washing (utilizing the high-pressure coolant pump from a FANUC Robodrill VMC). For video of the demo, visit short.mmsonline.com/ debcel . 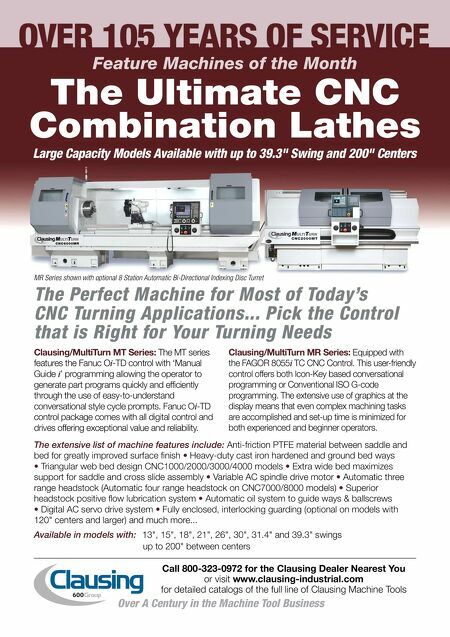 Methods Machine Tools Inc., call 978-443- 5388 or visit methodsmachine.com.